Rich and delicious, this fudge brownie mix will bring a big smile to your face. Made with imported Belgian cocoa, they’re sure to please any chocolate lover! Free of dairy, eggs, nuts, gluten, peanuts and Kosher. 16 oz package makes around a dozen brownies. $6.99 per box. From Anonymous of New York, New York on 2/18/2011 . 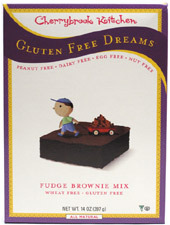 Rich tasting, kids ages 1, 4, 10, and 12 enjoyed and are asking for more. From Laura of Minneapolis, Minnesota on 11/27/2010 . These are some of the best brownies I have ever had! My non-vegan co-workers loved them. MUST BUY!! I love this brand! From Vegangsta! of San Antonio, Texas on 1/22/2010 . From Anonymous of Kirkland, Washington on 9/2/2009 . Hands down the best and easiest brownies to make and absolutely delicious. No oil separation, not runny, not slabs of tasteless glop. Wonderful wonderful. Add some nuts or some vegan marshmellows ... oh my. And easy enough for our 12 year old to make unsupervised! Don't miss these!! From Diana of Austin, Texas on 2/20/2009 . Made these for a party and everyone loved them. Very rich. Allergen This item is manufactured in a facility that also processes soy.